Home avaliação imóveis avaliador imóveis EVS método comparativo de mercado método do custo método do rendimento Justifica-se a utilização do método do custo? Justifica-se a utilização do método do custo? A utilização do método do custo para a estimativa do valor de mercado de imóveis continua a ser muito utilizada por alguns peritos avaliadores de imóveis de avaliação imobiliária. Quanto a nós, na maioria dos casos, erradamente. O método comparativo de mercado, por comparação com imóveis idênticos existentes no mercado, e após homogeneização, estima o valor de um imóvel. Deste modo, torna-se necessária uma comparação com valores de transação de imóveis equivalentes e que possam ser comparados. O método do rendimento assenta na capacidade que um bem possui para gerar rendimentos durante um determinado período, tendo por base as condições normais do mercado, e na conversão desses rendimentos, numa valorização atual. No entanto, é universalmente aceite pelas boas práticas de avaliação que o método do custo só deve ser utilizado em último recurso, ou seja, para imóveis especializados ou raramente transacionados. 6.4.1.1 The cost approach is most commonly used to estimate the replacement value of specialised properties and other properties that are very seldom, if ever, sold or let in the market. This means that the cost approach is generally only ever used when a lack of market activity precludes the use of the comparative method and when the properties to be valued are not suited for valuation by the income approach. There are, however, circumstances where it is used as a principal market-related procedure, particularly where there is significant data available to enhance the accuracy of the procedure. 6.4.1.2 Because cost and market value are usually more closely related when properties are new, use of the cost approach is easier when estimating the market value of new or relatively new constructions, but this is not to say that the cost approach should be adopted for this type of property unless there is a total absence of market evidence, or in the situations alluded to above. Indeed, in some cases the rental, occupational or investment markets may have changed considerably between the date when the construction cost was fixed and the date of final completion of the project, in which case the value obtained by the cost approach may no longer be a reliable measure of the market value. Using the cost approach for older properties can cause difficulties because of a lack of market data, both for construction costs and for depreciation, although this can also be true for certain newer properties. 6.4.1.3 Opinion varies across Europe as to the extent to which the Cost Approach can give a reliable indication of Market Value. It would appear that the countries that are against the use of this approach tend to be the ones where the market is more transparent and where more rental, yield and price evidence is therefore available. In addition, where markets are more volatile there is resistance against using cost as an indicator of value, as building costs react more slowly to cyclical changes than do market prices and rents. In contrast, the Cost Approach is often more widely used in markets that are less volatile and/or less transparent. Nos dias de hoje, o imobiliário caracteriza-se cada vez mais como investimento. 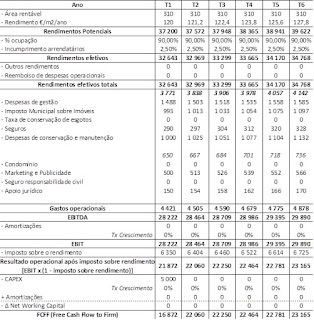 Deste modo, o método do rendimento na avaliação de imóveis deverá ter primazia sobre qualquer um dos outros métodos.